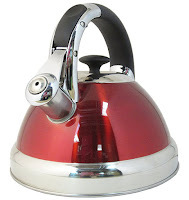 Native Spring 3-Quart Tea Kettle #NativeSpringTeaKettle This sturdy stainless steel Whistling Kettle brings out my nostalgic emotions. It reminds me of the tea kettle that lived on my mother’s stove during my 1960’s childhood. The high quality kettle holds 3.0 Liters. It has a strong aluminum base which promotes optimum thermal efficiency and heats quickly. Did you know that microwaving your water for tea is not a good idea. The microwave could make your water too hot. The tea kettle gives you much more control on reaching the correct water temperature for your favorite beverage. While this product is called a ‘Tea Kettle,’ my favorite use for it is to make my grandsons their hot chocolate. I love the stylish colors offered by this company: Blue, Green, Purple and the one I ordered – Red. Native Spring tea kettle is made of durable stainless steel that holds and heats up to 3.0 liters of water. 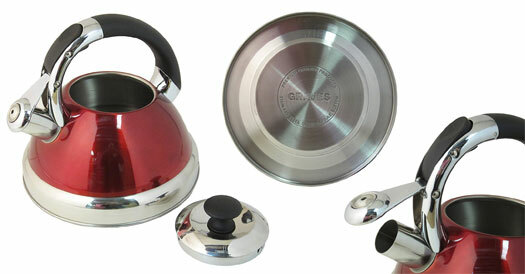 It provides great style and functionality for daily cups of tea, coffee, and other hot beverages. Its Heat-resistant synthetic handle is designed for use on gas, electric, or glass boilers. It Includes a whistling lid and flip-up spill cover for safe and easy pouring. This kettle warms up quickly and retains heat very well. Its classic and shiny looking features will compliment any kitchen. MADE OF DURABLE Rust-free metal and a heat resistant handle that will last for years. The beautiful shading will compliment your kitchen. 3.0 Liter Water CAPACITY holds heat for a long period of time which ensures you a warm cup of tea. LOUD WHISTLE pleasantly signals you as to when the water is boiling, allowing you to maximize your time while waiting. FLIP-UP SPOUT CAP feature stays open - allowing precise, safe, and easy control while pouring. SNAP TO CLEAN by simply wiping with a soft kitchen cloth or placing in your dishwasher. At Native Spring™ they pride themselves in offering world-class products and customer service. They care about your needs and will do everything they can to answer your questions and serve you to the best of their ability.